Do you need some extra storage space for all those video and audio files you keep creating? There are many different options for external storage, but we’re going to focus on external SSDs (solid-state drives) here. They are fast, small, and secure. A spinning HDD (hard disk drive) is typically much slower and can be broken easily if dropped or dented. An SSD does not have any moving parts, making it much more rugged and portable as well. Even if you don’t need to travel with it, their speed makes them an excellent option to expand your storage capabilities at home with a desktop or laptop. Before we get into the recommendations, I just want to let you know that brand matters. Cheaper knock-off or no-name brands tend to fail sooner and have much less quality control (if any). These things are small, fast, and light, but durable with read speeds of up to 540MB/sec and write speeds of up to 515MB/sec. They even have the ability to add password protection with hardware encryption so you know your data will be safe. It uses a USB Type-C (3.1 Gen 2) connection but they also include a USB Type-C to USB Type-A (2.0) cord as well. 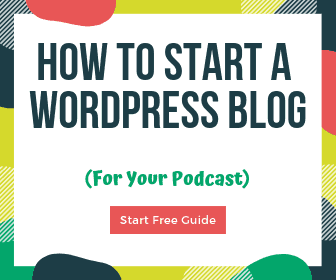 The best value at the time of writing is the 500GB or 1TB size options. 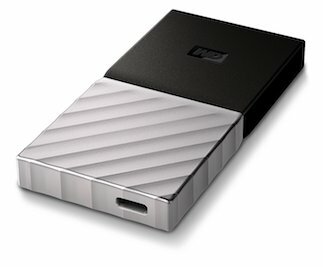 Western Digital is well-known for their hard drives and has a great line of portable SSDs. Read speeds go up to 540 MB/sec, they have password protection & encryption, and use USB 3.1 Gen 2, while also being compatible with USB 3.0, USB 2.0, and more. Price, speed, size, and features are comparable with the Samsung T5 and both make excellent options. 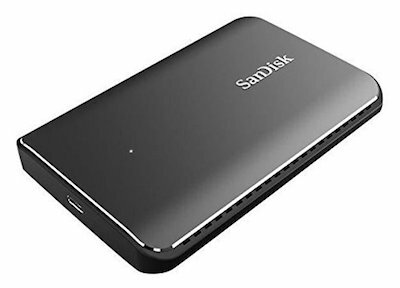 The current model of the SanDisk Extreme Portable SSD was released early in 2018 and replaced the SanDisk Extreme 500. It uses a USB 3.1 Gen 2 (Type-C) connector, has max read speeds up to 550MB/sec as well as write speeds up to 500MB/sec. The SanDisk Extreme 900 is purely focused on speed. You might say it sacrifices a tiny bit of portability to achieve 850MB/sec in both read and write speeds, but if you just have it sitting on your desk, it’s still pretty small (5.25 x 3.25 x.70 inches to be exact). It uses USB 3.1 Gen 2 and has 3 different storage capacity options: 480GB, 960GB, and 1.92TB. 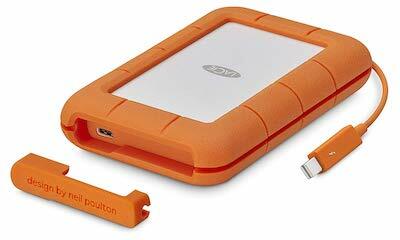 LaCie is well-known for their Rugged line of external drives. The SSD versions have both USB-C and Thunderbolt connections, up to 510MB/sec data transfer, and 3-year warranty. As you can see, the drive is built into a surrounding bumper that further protects it from drops and dust. 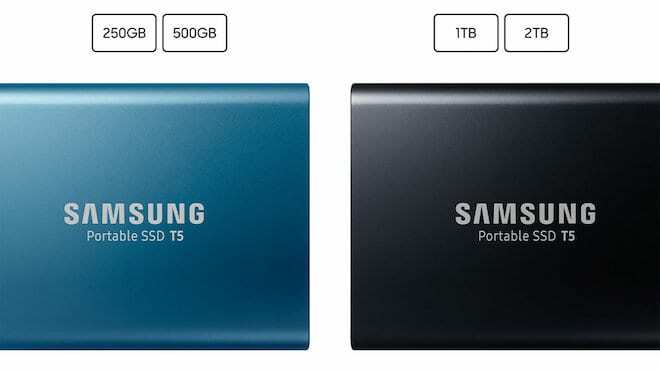 You can get the SSD version in either 500GB or 1TB capacities. 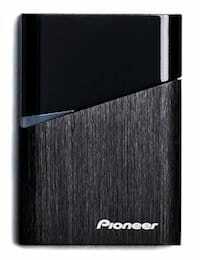 Pioneer has a great offering, especially if you’re looking for less storage space and a little cheaper. Their USB-C Portable SSD has speeds up to 480MB/sec, comes with a 3-year warranty, and storage options of 120GB or 240GB. You can find better a better value higher up the page for the ~250GB options, but the 120GB version seems to be decent price if you just need a little extra space. 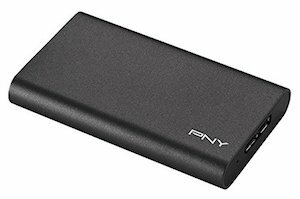 We’re going even smaller than some of the other portable SSDs with the PNY Elite. The speeds aren’t quite as fast as some of the larger models above (430MB/sec Read, 400MB/sec Write) but you get a drive about half the size of a credit card. It uses USB 3.0 but has a special connector, which I’m not a fan of because you will need to keep a specific cable just for this drive. You can get it in 240GB or 480GB capacities at reasonable prices. 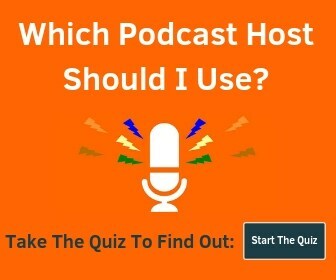 Glyph is a New York-based company that has gained some prominence in the creator community (you know, podcasters, YouTubers, gamers, etc.). They make a range of hard drives and what’s unique is that you can get a RAID SSD for faster performance (this is a technique that uses two physical drives at the same time) and it’s sold as a single drive. 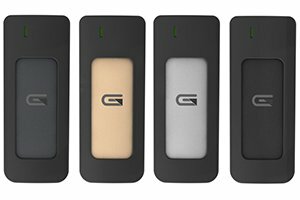 They also offer single AtomSSD models in several storage sizes (check out the 1TB option here) and different colors (Grey, Gold, Silver, Black). They are Thunderbolt 3 and USB-C (3.1 Gen 2) compatible, shockproof, made of aluminum, and work with Time Machine backup.